Soomi Kim in Chang(e). Photo by Benjamin Heller. 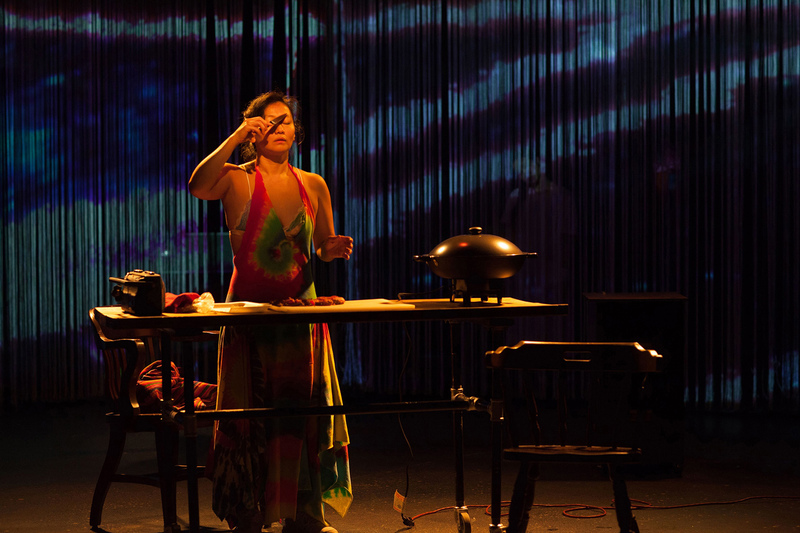 BOTTOM LINE: An expressionistic exploration of the life and death of activist Kathy Change. On October 22, 1996, activist/performance artist Kathy Change self-immolated in front of the peace-sign sculpture at the University of Pennsylvania’s Van Pelt Library. An outspoken advocate for social and economic reform, Change frequently staged theatrical one-woman protests on the UPenn campus, but received little more than scorn from the students, media, and society she tried so vehemently to reach. Her last letters frame this self-destructive act as an outcry against corruption and a prayer that her death might call attention to the convictions for which she stood. Devised as part of the HERE Artist Residency Program (HARP), Soomi Kim & Suzi Takahashi’s Chang(e) offers an expressionistic take on Change’s story, exploring the outer and inner forces which prompted her fiery conclusion. Chang(e)’s action begins on the campus where her life ended, as the titular heroine (Soomi Kim) enters like a colorful whirlwind, shouting slogans to passers-by and audience alike. As the show navigates Change’s final months, we learn the motives behind her drive for transformation and witness her growing frustration with a world that will not listen. A reenactment of a campus-radio interview with UPenn correspondent Brendan McGeever (Ben Skalski) reveals Change’s backstory: born Kathleen Chang, Change’s formative years were marked by her mother’s suicide and her own struggles with self-harm and mental illness. Known for her marriage to playwright Frank Chin and roles in both Chin’s Asian-American Theater Workshop and the countercultural movements of the 1970s, Chang, in 1978, began receiving visions prophesying the world’s end. Convinced she could save society, Chang re-named herself Kathy Change and moved to Philadelphia, where we now find her moonlighting as a stripper while composing ardent manifestos and radical public performances. Despite countless attempts, Change can find neither suitable channel nor receptive public for her message. Attempts to reach major news outlets from the Philadelphia Inquirer to the newly-established Democracy Now! fall flat. Her alliance with a hippie protest group proves as fruitless as a love affair with the Mumia Abu-Jamal activist (Adriana Spencer) who led her to it. Chang(e) continually walks the line between fantasy and reality, depicting a woman so internally ablaze that her incendiary death seems almost fated. Takahashi and choreographer Alexandra Beller embody Change’s passion and torment through a number of vivid, surrealistic dance sequences. The agile and versatile ensemble cast alternately becomes specters from Change’s past (her mother, her suicidal younger self), demons from her present (real-life detractors, jeering hundred-dollar bills), and images of China’s mythic history and stark reality (dragon dancers, Chinese-American railroad laborers). Kevan Loney’s audio-visual projections similarly blur these boundaries, mixing fantastical imagery with direct quotes from Change and video interviews with the people who knew her. Are we to view Change as insane or visionary, her final act heroic or desperate? With her ragged attire, shopping cart of props, and doomsday tirades, Kim’s Kathy Change brings to mind the mentally-ill homeless with whom New York audiences are all too familiar. Yet her warnings of economic collapse, government surveillance, environmental devastation, and international turmoil read eerily prescient in the current socio-political landscape. Kim and Takahashi go to great lengths to paint Change as a messianic figure—references to doomed prophets and Scripture abound, and the recurring motifs of fire, death, and destruction seem almost transcendent under their psychedelic touch. However, this depiction would have been better served by giving equal weight to conveying Change’s political message as to representing her disturbed mind and oppressive environment. We empathize with Change’s humanity and struggle, but in effect it inspires more pity than awe. Chang(e)’s heroine may end the play as a rising yellow-clad phoenix, but it is the creators’ post-show distribution of her literature which makes the more noble attempt to honor her legacy. Perhaps, by exposing us to Change’s life and work, Chang(e) may ensure that her death was not in vain. Chang(e) is devised in collaboration by Soomi Kim and Suzi Takahashi. Directed by Suzi Takahashi. Original Music composed by Adam Rogers (guitar). Set Design by Bryce Cutler. Video by Kevan Loney. Costume Design by Machine Dazzle. Lighting Design by Lucrecia Briceno. Sound Design by Iggy Hung. Choreographic Consultation by Alexandra Beller. Stage Management by Alex West. Assistant Direction by Leta Tremblay. Chang(e) features Soomi Kim, Criena House, Kiyoko Kashiwagi, David Perez-Ribada, Ben Skalski, Adi Spencer, and Zeke Stewart.